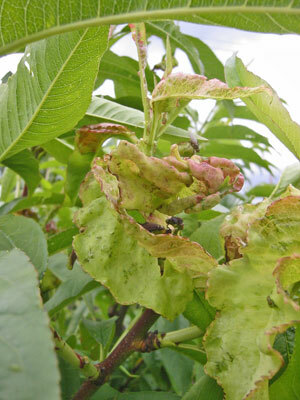 Peach Leaf curl is caused by the fungus Taphrina deformans. The spores of the fungus lodge in the bud scales of peach and nectarine trees in the summer, overwintering there until the tree begins to break dormancy. At that time, the new leaf tissues are infected, causing the cells to grow larger than normal, which gives the diseased leaf the characteristic swollen, distorted look. Wet conditions and temperatures from 48° to 70° favor the fungus. Sounds like our typical spring weather, doesn’t it? 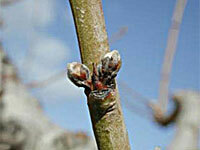 Now is the time to be monitoring peach and nectarine trees for bud swell. To control peach leaf curl, it is important to treat for the disease just as the bud begin to swell. This can occur anytime from mid-January through early February, depending on temperatures. The last couple of years, bud swell has started in early January. 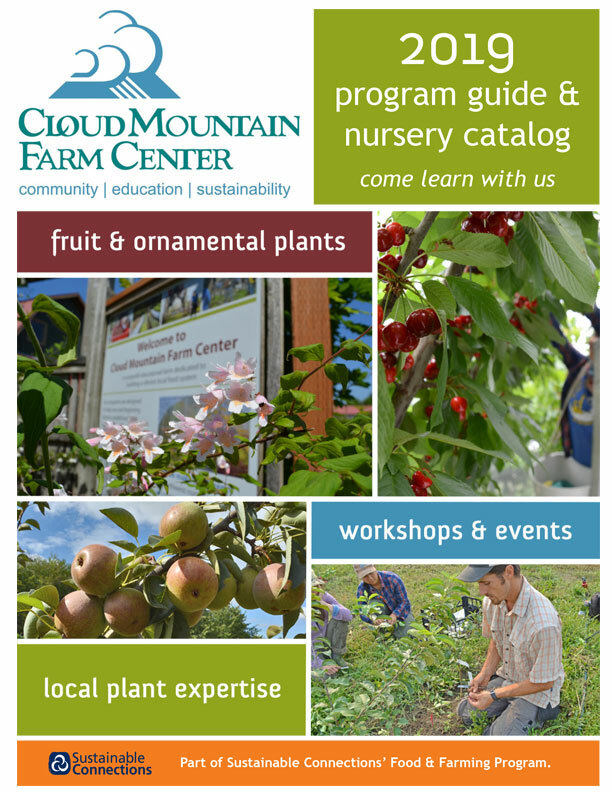 With the warmer than normal winter we’ve had, the peaches at Cloud Mountain are beginning to swell now. At Cloud Mountain, we use lime-sulfur to control peach leaf curl. Fixed copper products are also effective and much easier for the home owner to buy. Sulfur and copper products don’t kill anything. They act as prophylactic controls, smothering the spores by not allowing sufficient oxygen for the spores to germinate and infect the buds. 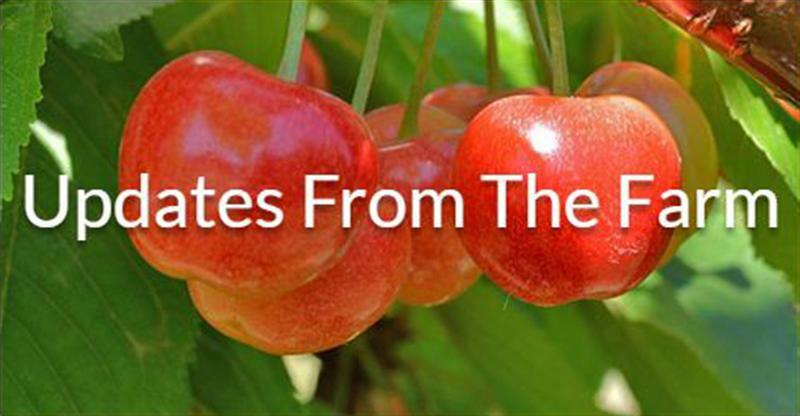 Take home message: The spray has to be on the tree before temperatures and rain allow an infection! And, a reminder, even organic pesticides are toxic, so always follow label directions! Why control Peach Leaf Curl? A slight infection probably won’t seriously damage your trees, but severe or repeated infections can. The distorted leaves cannot photosynthesize as well as uninfected leaves, and usually drop early. This reduced leaf surface stresses the tree. Severe infections also distort the new growth and flower buds, reducing fruiting. We don’t always get the timing exactly right, but we get good enough control that our trees are not too stressed by the small amount of leaf curl that they get. If you have trees of curl resistant varieties, such as Frost, Avalon Pride, Salish Summer, Betty, or Indian Free, you should still control peach leaf curl if the trees are young. Resistant varieties can still get the disease, and are not established enough to tolerate the disease without stress. Another reminder, wait to prune stone fruit until after bloom. 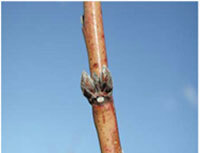 Pruning while dormant can actually bring your trees out of dormancy, which can be detrimental in a frosty spring.